"When I was about to quit Paris to embark for the United States, the better to insure comfort, when in camp, I judged it of importance to engage in my service a cook of celebrity. The American army was posted at Valley Forge, when I joined it. Arrived at my quarters, a wagoner presented himself, saying that he was directed to attach himself to my train, and obey my orders. Commissaries arriving, furnished a supply of beef and bread, and retired. My cook looked around him for utensils, indispensable, in his opinion, for preparing a meal, and finding none, in an agony of despair, applied to the wagoner for advice. ‘We cook our meat,’ replied he, ‘by hanging it up by a string, and turning it before a good fire till sufficiently roasted.’ The next day—and still another passed, without material change. The Commissary made his deposit. My cook showed the strongest indications of uneasiness by shrugs and heavy sighing; but, with the exception of a few oaths, spoke not a word of complaint. 3. Washington and his men passed the winter of 1777-78 at Valley Forge, twenty miles from Philadelphia, on the river Schuylkill (skool'-kill). It was a season of want and the most severe suffering. Four thousand men were unable to leave their huts for want of proper clothing, and few had blankets even at night. 4. The British army, who were but twenty miles off, paid for their provisions in gold and silver, while Washington had nothing but the paper money of Congress, which was now of little value. So the farmers preferred selling to foreign soldiers to supplying their own countrymen. Congress therefore authorized Washington to seize upon what he wanted, within seventy miles of the camp. 5. 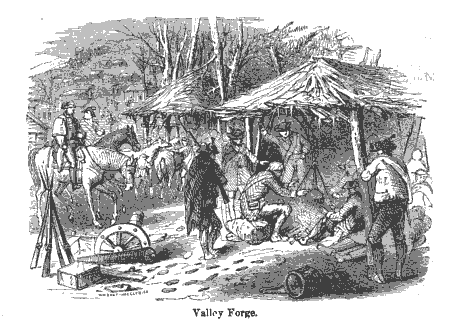 This wretched state of things at Valley Forge caused some members of Congress to think that Washington was incompetent, and several even advised his removal. But the country met the proposal with indignation, and Congress finally saw that they were themselves to blame for the sufferings of the army in winter quarters.